Free Time is a well-equipped luxury camping site on the outstandingly beautiful sea coast at Marina di Bibbona in Tuscany, on the west coast of Italy. 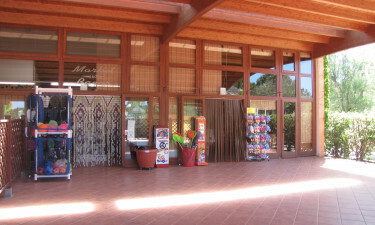 It is a favourite with families as there is so much to do in the holiday camping site which is close to the beach. It is an hour from Florence, and 40 minutes away from the enchanting town of Livorno. For more exciting details please visit: Lux-Camp. There is a great choice of camping luxury accommodation including: a bungalow tent, a luxury tent, or a mobile home. If you like swimming, there is an enormous pool and aqua gym, a water slide, a children's pool and playground, and lots of on site entertainment organised by the camping holiday team. There is plenty of sailing and surfing in the area, and the site has its own bike hire. Why should I camp at Free Time, near Marina di Bibbona? Bibbona has some wonderful medieval buildings to explore, and a visit to Florence, the capital of Tuscany, is a must: it houses a huge art museum, and has a wealth of Renaissance architecture and art, and plenty of shops. You can also visit Livorno, a picturesque port with magnificent scenery. The beach can be reached by crossing a road or by taking the free shuttle bus provided by the camp site. Within the luxury camping site you have a choice of enticing restaurants and snack food outlets at your disposal, and the local area has more places to eat, in addition to bars and interesting shops. Please note: A club card is needed to access the evening entertainment (after 21:30) and the fishing lakes. 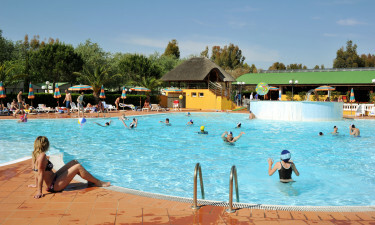 It is 5 euro per person for the whole stay and children below 12 years old are free.